Need a way to maintain process temperature for a holding tank? Looking for something easy to install and connect? 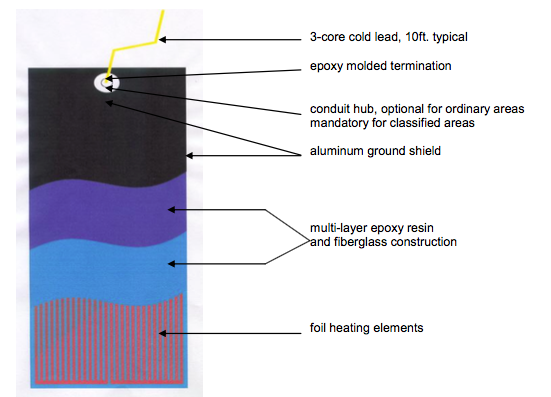 Consider an epoxy laminated electric heating panel. These heaters use a flat foil resistive element which is laminated in a multi-layer fiberglass construction using epoxy resin. The manufacturing process is done under tightly controlled heat and pressure to assure bonding and structural integrity. The resulting electric heater design is a semi-flexible panel that is waterproof and durable. Epoxy laminated panel (ELPs) are a very versatile option for tank heating. ELP heating panels can be used in a variety of applications from freeze protection to process heating with exposure temperatures ranging from -40 F to +212 F. ELP heating panels can be used on either vertical or horizontal tanks with diameters of 48" and above, with either metallic or non-metallic construction. They can also be used in dry, wet, or corrosive environments, as well as for hazardous and non-hazardous areas. Installed view of epoxy laminated heater. They are quick and easy to install and require no special tools or skills. Heaters are usually installed by banding them to the tank with metal bands or polyester straps, which takes only a matter of minutes. After installing the heating panels, adhesive aluminum tape should be applied to the edges of the heaters acting as a seal. This will prevent thermal insulation becoming trapped between the heating panels and the tank. The heaters provide a low watt density heating profile, and along with their inherent low mass, ELPs provide excellent thermodynamic performance.